Discovering "Why I'm In It"
As my teammates and I walk into the warm, Crothersville agriculture classroom, we read this mindblowing statement written on the chalkboard. It’s a cold, icy, Saturday morning, but the energy and passion in Crothersville High School made it feel like the warmest place on the planet. 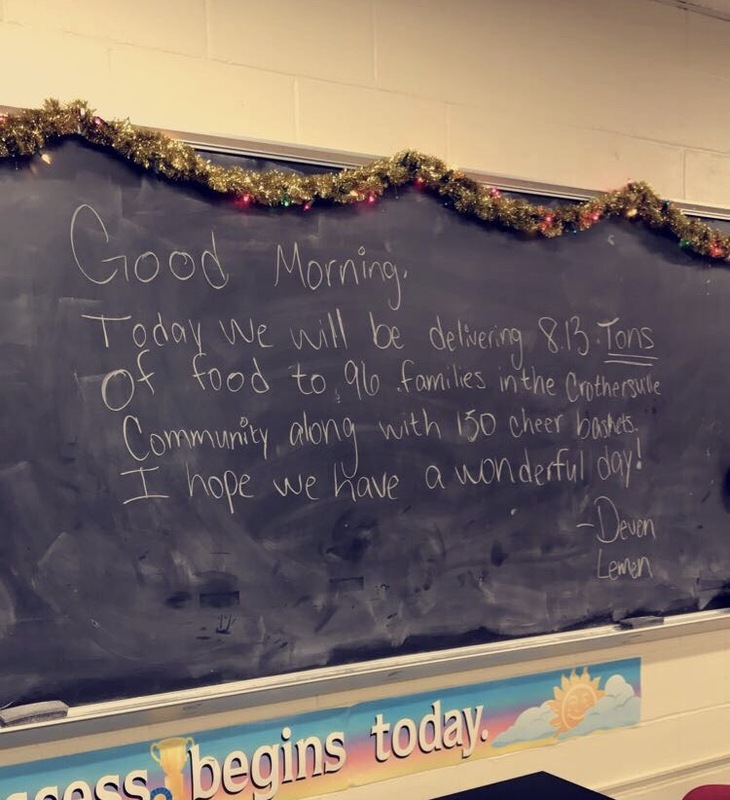 We had been requested to go to a service project, and all we knew about the event is that we were delivering food and that there MAY be the opportunity to ride on a firetruck. A photo with our team and Crothersville FFA Officer Team! A few of the amazing chapter officers explain that this is the 28th annual FFA Food and Toy Drive and that we would be delivering boxes of nonperishable foods, hams, eggs, milk, and fruit to families in need in the Crothersville community. As the day goes on, we make a few deliveries, and return back to school to warm up with some hot chocolate. I had no idea that the next delivery we would make will change my outlook on life forever. We pull into the driveway of a house and we begin to load the boxes of food and toys into the back of a car, as directed by the woman on the porch and the man helping us load. The delivery seemed so normal, until I go to deliver the letter to the woman on the porch. I reach out to shake her hand and as I look into her face, I see tears welling up in her eyes. Immediately I join her on the porch and give her a hug. In this moment there was no one else in the world, just this woman and I. She sobs and thanks me, saying I’m a blessing, but as I pull away from the hug with tears welling in my eyes, I realize that she is the true blessing. I later found out that this family had recently experienced a loss only a week before, and I honestly could not believe that I had the honor to play such a small part in making this family’s Christmas just a little brighter. 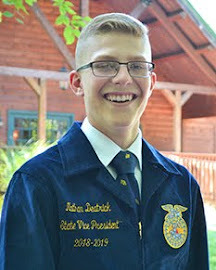 This feeling of realizing “why you’re in it” has made me realize that this year of service to Indiana FFA is nothing compared to what I can give in my entire life, the desire and passion to serve that I have left in me. Thank you Crothersville FFA chapter for giving me the opportunity to serve, and to impact someone’s life in such a small way. One of my very first encounters with hundreds of Indiana FFA members was on our journey throughout the state during the month of September for District Kickoff season. At each district, we promoted our newest program for the Indiana FFA Foundation called the “Pay-It-Forward Campaign”, which focuses on raising enough funds to pay off the mortgage of the Indiana FFA Leadership Center. In an effort to promote the program, our team created a video of “101 Reasons to Love the Leadership Center”. 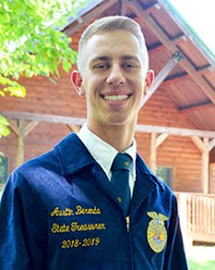 One specific reason that was given to us by FFA members was the bridge that links the Conference Center to the back of the property near the boys’ cabins. The team and I decided that I would skip across the bridge in a very excited fashion for that section of our video – so I did just that. I was excited and bubbly, until…..my FitBit got caught on my jeans and plopped into the lake. As I watched the FitBit fly into the air and sink into the water, I yelped and ruined that whole section of the filming. While I was deeply upset by what I thought was a huge loss, my team and I decided to include this portion in our overall video, but instead of dedicating it to ‘The Bridge’, we used it as a way to portray ‘Giving Up Technology for a Weekend’ while FFA members spend time growing as leaders. 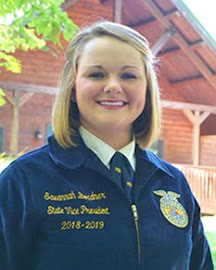 As nearly 2,000 FFA members watched this video, that was one thing that stuck out to them. To this day, members across the state recognize me as the State Officer who lost her FitBit in the lake. When I first lost my FitBit, I was disappointed that I would not be able to count the steps for the next few days, track my sleep hours, and, most importantly, would have to spend another $140 to replace it. Luckily, the company replaced it for free, so I lucked out in that aspect. But, looking back, I lucked out in many more areas. That one event that I thought was a devastation really lead to a memory that my team and I will never forget. It opened my eyes to the fact that materialistic items such as a smart watch will never replace the moments when FFA members can laugh with you about something silly that happened. I was a bit excited when my new FitBit came in the mail! The most important lesson that my FitBit taught me, however, was that it wasn’t the daily steps that truly counted; it was the memories and irreplaceable moments that did. Materialistic items control our daily lives these – we spend hours on our cell phones, we couldn’t live without our FitBits and Apple Watches, and we have to drive the best of the best car. But, are we truly living the best lives? At times, I get so caught up in social media that I forget how to have an actual conversation with someone. There are other times where I become so jealous of someone else, that I forget to be appreciative of what I have. When I spend time with family and friends, my eyes are way too often locked on my phone screen, when the reality should be that my ears are locked on what words of advice they are sharing. In a world filled with technology, I want to encourage you to take a few moments each day to truly engage with those around you. Make cherishable memories that will last a lifetime. Get rid of your “FitBits” of the world, and start truly living. Make a mental list of the things you’re involved in. Are you in a club? Are you an officer of an organization? Do you have a job? Are you a part of a community service project? Whatever it is that you’re involved with, do you truly enjoy what you’re doing? Think about it for a moment. When you’re in the middle of a meeting, waking up for work, helping others, or doing whatever it is that you do, are you truly loving the effort and dedication that you’re providing? This week we had the honor of hosting the Retired Agriculture Teacher’s Luncheon at the Indiana FFA Leadership Center. Let me tell you, I’ve never been in a room with so many elderly, energetic, and passionate people. These retired teachers reconnected with fellow teachers, shared memories that are worth tons, and truly felt at home. As they were sharing their wise words, one retired teacher from Jay County High School, Bob Lyons, said something along the lines of this- if you go to work and you feel like you’re working, you need to find a different job. You should be having fun with your profession and truly enjoy what you’re doing. I let these words soak in for a moment and took them to heart. I realized that what I’m doing right now in life, doesn’t feel like work at all. It feels more like happiness, passion, and dedication. Two of my genuine owls, Mr. Younts and Mrs. Keffaber, who have given me advice since my first day as a FFA member. The advice that Mr. Lyons gave are some of the truest words I’ve heard. Not only should we never feel like we’re working in our profession, but we shouldn’t feel like we’re working with anything we do because that is the moment we know that we’re doing it for the right reason. When the long hours put into that club, organization, volunteer work, or anything humble you rather that make you bitter, that’s when you know you’re doing what you love. As we go about our days, let’s take a moment to reevaluate the things we do and ask ourselves if we truly do love what we’re doing. If so, that’s fantastic and I hope you continue to stay humble. If not, search for those things that you love and genuinely make you happy. Love what you do and never dismiss advice from an owl. My family is HUGE on traditions – and it is no different during the Holiday Season. Every Thanksgiving my heart is filled with gratitude and thankfulness as I spend time with family and friends. Whether it is a competitive game of ‘Spoons’, decorating my Grandma’s house for Christmas on Thanksgiving Day or listening to stories of memories from long ago, every Thanksgiving reminds me of deep rooted traditions that my family shares. Likewise, Christmas would not be the same without certain traditions – Christmas Eve Service, endless hours of baking and decorating Christmas goodies, wrapping presents for the ones I love or the iconic Christmas card picture that we always take and send to hundreds of friends and family. Even traditions such as watching 'Christmas Vacation' (Every family can relate to the stars of this movie - including Cousin Eddie!) and other Christmas classics make the season even more majestic. These traditions are something I value and appreciate about this most wonderful time of the year. In Indiana, we have cows instead of reindeer! This is one of my most memorable Christmas Card picture! Similarly, I have found these same values of tradition and gratitude within the National FFA Organization. Truthfully, I joined in 7th grade because of the family tradition, I am the 3rd generation of FFA members within both sides of my family. This feeling of tradition encouraged me to grow in my leadership skills and become as involved as possible. 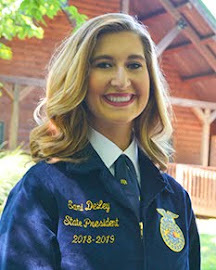 From the blue corduroy jacket to opening and closing ceremonies to enjoying everything that the Indiana FFA Center has to offer – the traditions within FFA are awe inspiring and have something to offer every single person. These traditions are what the National FFA Organization was founded on and continues to strive as we continue to improve our organization. 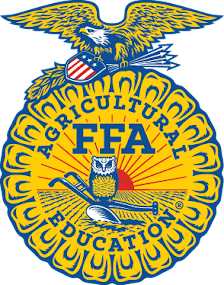 So the next time you see the emblem, hear the FFA Creed, receive a degree or award or put on official dress – realize the value of being involved with such meaningful traditions that FFA gives each and every member. Being involved in FFA is a tradition that I will always be grateful for - and owe so much to! This year, it has been wonderful to start new traditions with my six new siblings and teammates. 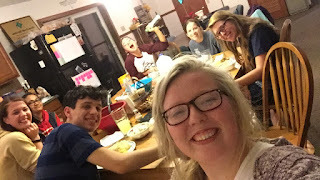 From making our very own Thanksgiving meal (accurately called 'Teamsgiving') and sharing what we are thankful for to decorating our home for Christmas and buying special gifts for each one of them it has been the greatest blessing to start new traditions. These memories of laughter, fun and togetherness are ones that I will always cherish. I encourage you to take the opportunity to create new traditions with the ones that you love. Enjoy these times of tradition – not only with your family, but within the organizations you are involved with. Continue to make new traditions and embrace the old. 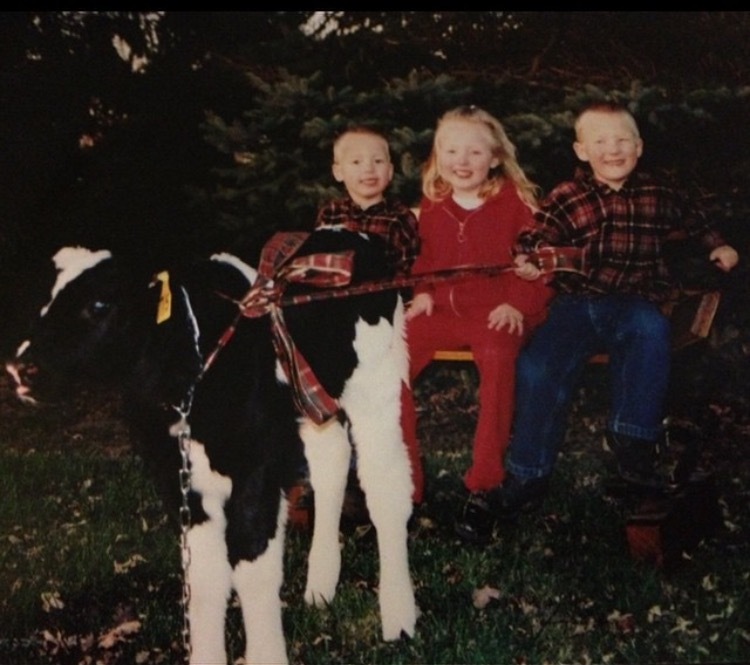 I encourage you to appreciate the traditions that FFA has to share with YOU! I hope that you had a wonderful Thanksgiving and a very Merry Christmas! Wash your hands. Pick up your toys. Wear your jacket. Remember please and thank you. These words have been shared with myself as well as countless other kids throughout the years. When I was only eight months old, I had already learned how to use sign language to say the words “please” and “thank you.” That was before I even knew how to talk. I would sign the words “thank you” to my Mom for giving me my favorite toy, but who would know that two simple words would be so important throughout life. It was November. I was a preschooler and I was excited. This month was full of adventures. Not only did I get to make beautiful hand turkeys, but I also could rock the pilgrim hat. This was only the beginning, on one special day it was time to go to my Grandma’s house. I arrived and enjoyed some scrumptious food and great times at the kids table. 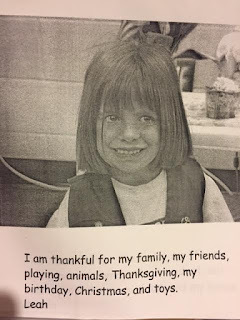 Then came the tradition of sharing what we were thankful for. After listening to my family share about items that I did not understand at the time, it was my turn. I listed off the following items: Mommy, Daddy, pigs, cows, stuffed animals and my Bitty Baby doll. Here I was a little bit older, still using the words “thank you,” even if I chose some unique things to share my thanks for. It was November. I was 19 years old and I was excited. Yet again, it was November and a month full of adventures. This time, I traded out the creative hand turkeys for flipcharts and the pilgrim hat for official dress. I still love the month of November, but the reasons why are slightly different. I love the chance to serve such incredible FFA members. I love the food we celebrate with and have a deeper appreciation because of the farmers who toil to provide it. I love the time spent in fellowship with friends and family because I am lucky to have the moments I spend with them. I love that the kids table has transitioned into a big kid table as I make memories with great teammates. As I think about what I am thankful for, I realize how blessed I am. The words “thank you” are way more than words parents annoyingly reminded us to say. Saying thank you should be a way of life. What I appreciate should be appreciated in November, but also throughout the year. Let’s show an attitude of gratitude in all we do. It does not have to be a huge act. It can be as simple as sending a quick text telling friends they are appreciated or sending a thank you note to someone who does not hear it enough. Let’s not only celebrate this season of Thanksgiving, but instill a tradition of a life of Thanksliving. I have recently read a book titled, “How Full is Your Bucket?”. It is a book about leadership and not just developing yourself as an individual, but also by developing those around you. This was the first leadership type book I have ever actually read and I was a bit skeptical when I first began to get into it. In the beginning, I was thinking that it was going to be some typical, boring leadership words written in a book. However, once I finally flew the book open and began diving into its content, I realized that this book was about much more than just leadership, much more than just becoming a leader, and much more than just learning how to help others. The first chapter began with a very intriguing story regarding the Korean War, and this story drew me in at an exponential rate due to the fact that I have a strong passion for history. Then the author of the book began indulging his audience (me) into the meat and potatoes of the true meaning behind “How full is your Bucket”. The ideology behind the book is that when you fill someone’s bucket, they not only become happier and more productive, but you become happier and more productive. The phrase, “How full is your Bucket”, relates to the positivity or negativity levels an individual may possess. A person with a negative mind set does not have a very full bucket, while someone with a much more positive demeanor will have a full bucket. Within the book, the author portrays the fact that positivity as well as negativity will dramatically alter the productivity of someone. So, for instance, in a work place environment, the boss’s positivity or negativity levels will alter the productivity levels of those working for them. A boss that is extremely positive, encouraging, and rewarding will have positive effects on their employees, the boss will thus be filling the employees buckets, and the productivity levels will grow. On the other hand, a boss or employer that uses negativity in the workplace, will be dipping out of their employees buckets, which will lead to a loss of productivity. However, when it comes to rewarding a person for the success they have achieved, in hopes of filling their bucket, it takes a personal approach. Not every person likes to be recognized for their achievements the same way, so if an employer gets to know that person and then makes the recognition personable and germane to the recipient, the bucket of that person will be filled exponentially. This book that I read gave a me a new sort of vision when it comes to working on myself and how to work with and for others. I have found that when approaching a situation, a positive attitude is the most advantageous method. I found that when working with others it is best to focus on positives at a much higher frequency than negatives. It has also helped me realize that each and every person across this globe is unique as an individual and requires different methods of positivity, encouragement, and reinforcement. So, to the nearly 12,000 Indiana FFA members and its countless supporters, let’s be positive, not just for ourselves, but also for those around us. I challenge every person that reads this to begin thinking of ways to fill your friends, teachers, colleagues, and family’s buckets. It will help make them feel full of joy and excitement but it will also give you that warm fuzzy feeling you get when you make someone’s day better. Indiana FFA, how full is your bucket? Science, Streetlights, Swine, and Service. While these words may seem like a strange tongue twister, they truly summarize the experiences of my teammates, Mr. Martin, and I this past weekend at our fall retreat. 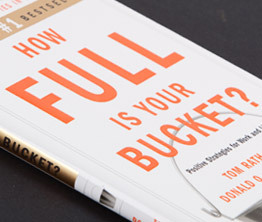 Before departing on this adventure we were told to read the book How Full is Your Bucket by Don Clifton and Tom Rath. This novel showed my teammates and I how we can use positive words to fill people’s buckets, and the horrible effects of dipping from someone’s bucket by using negative words. Showing off the differences in the back of our jackets with our new friends, we even named our group "Illiana." Science. 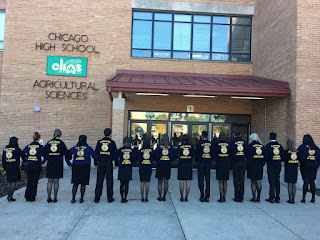 We began our journey by traveling to the windy city of Chicago to visit Chicago High School for Agricultural Sciences (CHSAS) where we were truly impressed by the knowledge and poise of the students who led us in tours of not only their state-of-the-art facilities but also educated us on their “pathway” in agriculture. 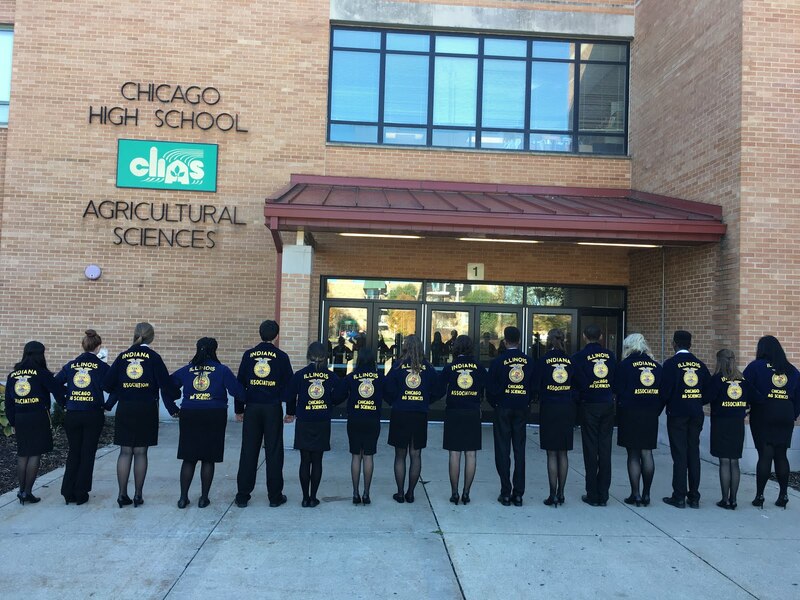 It was mind-blowing to see inner-city students share our passion for livestock, horticulture, food science, education, and all other areas of agriculture during our time in the windy city. These students truly filled my bucket by making us feel as we did our favorite dance, "The Juju" with some of the students. Streetlights. After our visit at CHSAS we headed into Downtown, Chicago which was painted in the colors blue and red as they celebrated The Chicago Cubs winning the World Series. 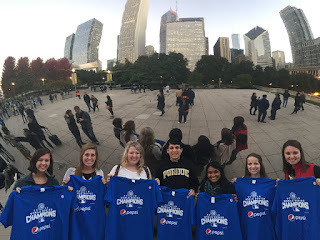 From getting a free t-shirt, to visiting the Shedd Aquarium, to taking selfies at “The Bean,” my teammates and I experienced life in a big city as some true tourists. 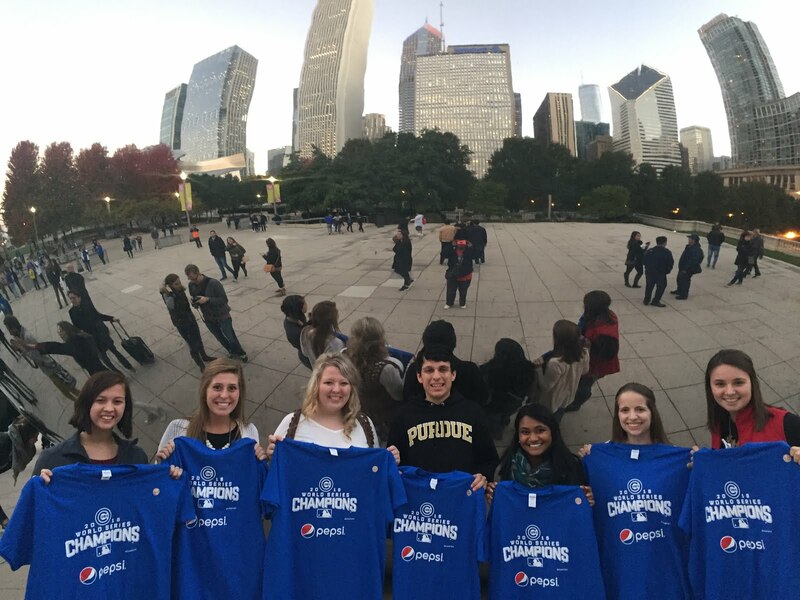 A typical tourist picture in front of The Bean sporting our new shirts that were given our in celebration of The Cubs' win! Swine. 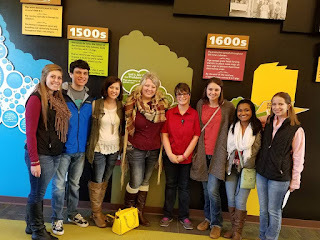 After getting our candy fix at the Albanese Candy Factory, we headed back into Indiana to visit one of the largest farms in the country, Fair Oaks Farms. After eating Emily’s celebratory birthday meal at the Farmhouse restaurant, we did everything possible including the Dairy, Swine, and Crop Adventures. 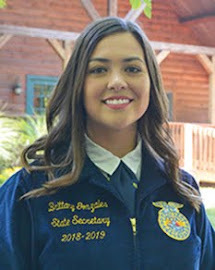 Similar to the passion for agriculture that we saw at CHSAS, I was truly impressed seeing one of our own Indiana FFA members in her Supervised Agricultural Experience in the Swine Adventure. Natalie Wagner, a senior at Kankakee Valley High School, gave us a personal tour of the Swine barns at Fair Oaks. Her speaking skills were outstanding and I was truly astonished that she could answer any of our questions without missing a beat. 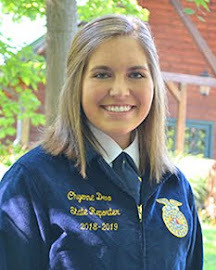 We truly hoped to fill her bucket after this visit by telling her how amazing she did as a host and FFA member. A picture with our OUTSTANDING personal tour guide, Natalie Wagner, from Kankakee Valley High School. Service. “Living to serve” is a part of the FFA Motto so what’s a retreat without serving others? We ended our trip in Downtown, Indianapolis at Circle City Relief, where we served meals and clothing to those in need in our own backyards. This was my favorite opportunity to “fill buckets” as Chaela Minor and I helped families sign up for the Christmas shopping event. I saw parents and grandparents moved to tears as the worry of affording Christmas presents was lifted off their shoulders. I witnessed those who utilized these services travel back to the warehouse with us to clean the kitchen where the food was prepared. Another “S” word to add to this list would be a term my teammates and I use often, “Serving Selflessly.” I learned that one of these volunteers who used these services actually lived under a nearby overpass, but chose to give back and help our team mop the floor of the kitchen, serve food to others in need, and even helped load up the trucks. This man was serving selflessly in a way that I had never seen before, giving everything to something that had given so much to him. 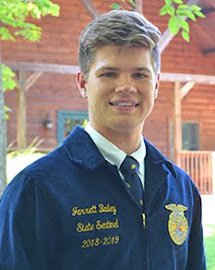 I have truly taken away that lesson from this man and am truly reenergized and ready to serve selflessly to the 12,000 members of the Indiana FFA Association!